On Tuesday 12th June 2012 UCLB hosted its Annual Summer Reception to celebrate a year of successes, with drinks, canapés and entertainment from UCL’s Jazz Society set against the backdrop of the neo-classical UCL Portico. 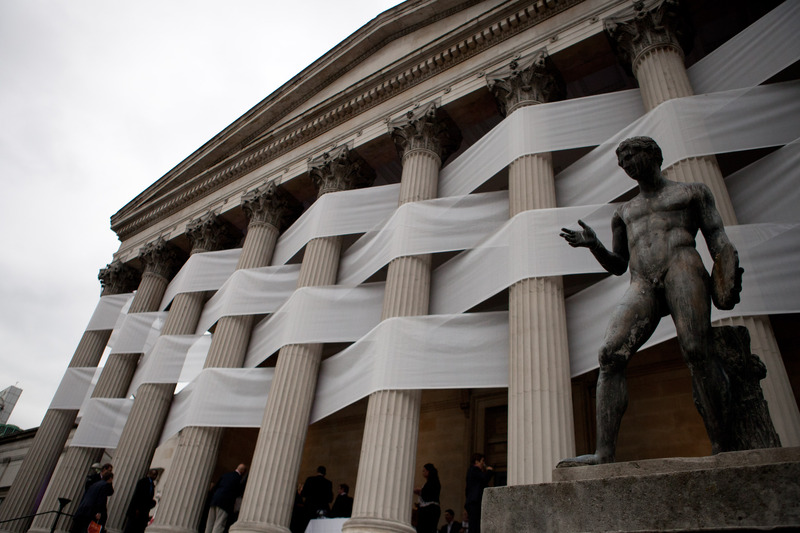 This year UCLB worked with Nicolas Feldmeyer, a UCL Slade School of Fine Art student, whose striking art installation of fabric woven in between the columns of the portico was installed as part of the school’s 2012 MA/MFA Degree Show. 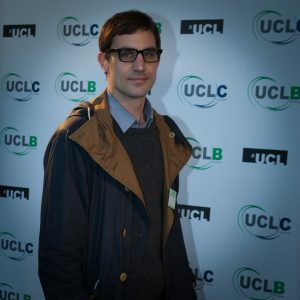 The event provided an informal networking opportunity for UCL’s researchers, guests of UCLB including representatives from UCL’s spin outs, industry, venture funds and many other collaborators to promote UCL Enterprise and demonstrate the benefits of technology and commercialisation taking place at UCL. 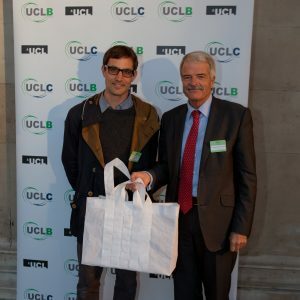 UCLB was delighted to welcome UCL’s President and Provost Professor Malcolm Grant, who addressed the guests with a speech about the importance and value of enterprise to UCL. The Provost also explained the idea behind Nicolas’ art installation and that the material will be donated to BIFTA Pathways, a social enterprise for people with mental health problems and recycled into bags designed by Yasar Spoerndli, an award winning fashion designer which will be produced in BITA-Pathways workshops. Cengiz Tarhan, Managing Director of UCLB outlined some of the highlights of the year, including reaching a £20m royalty threshold on a UCL developed treatment which is being used to save 400,000 lives and expressed the enormous impact of UCLB’s activities generally. 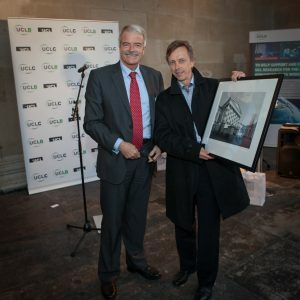 The winners of the annual UCLB prizes – two exclusive signed prints of the portico installation were, UCL’s Pro-Provost for Africa and the Middle East – Professor Vincent Emery and Nick Wood, Commercial Manager at UCL’s spin out Eurotempest.